Report delayed to September 12, 2017 due to compulsory evacuations as a result of Hurricane Irma. We are reporting this week from north Georgia. 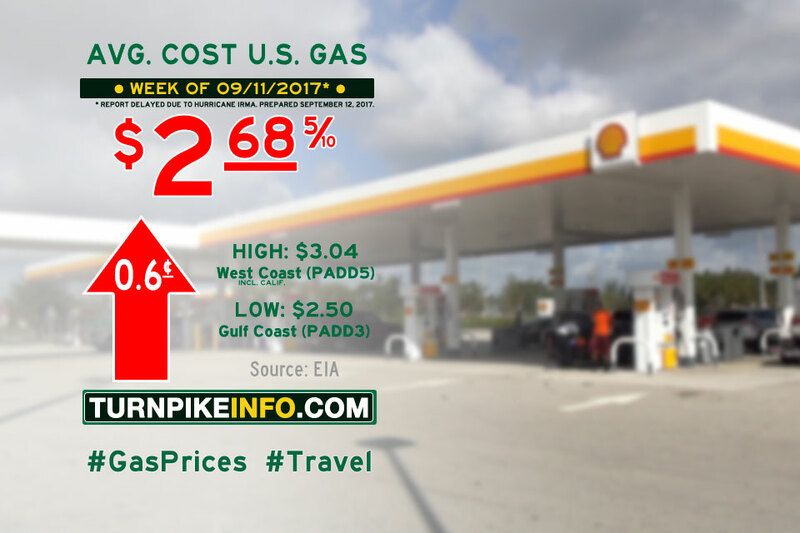 Oakwood, GA – The cost of driving increased again during the past week, according to the U.S. Energy Information Administration. The E.I.A.’s weekly price survey shows the cost of fuel increased another penny per gallon to nearly $2.69 per gallon of regular unleaded. The weekly price increase was relatively tame, however, compared with the shocking price hikes experienced only a week earlier, when Hurricane Harvey forced the closure of refineries across Texas and Louisiana. Prices went up, once again, in all regions, and it was unclear what impact the landfall of Hurricane Irma on Florida may have on the cost of gas prices in the Lower Atlantic region, which will likely be reflected in next week’s pricing survey. Meanwhile, prices across the Lower Atlantic region, like most regions, were up about a half cent per gallon. Prices across the West Coast and New England were up two cents per gallon, on average, dragging the nation’s averages higher this week. Diesel fuel prices also took another hit this week, rising over four cents per gallon. The average cost of a gallon of diesel is now over $2.80, while prices in some regions, particularly the West Coast, are now well in excess of $3.00. Regional cost averages for both gasoline and diesel are listed below, showing the current week and previous week. Prices are ranked from highest to lowest price.